Bobby Wagner the linebacker for the Seattle Seahawks is not only noted for his impressive counts, tackles, and touchdowns but also his speed and amazing body control in most of his games. Most running backs describe him as one of their nightmares in any game because of his defense threatening speed. Bobby has been rated as one of the best linebackers in the history of the National Football League (NFL). Ever since he went pro, he has executed over 100 tackles and has made several franchises records. His knowledge of the game has kept his moves articulated and brilliant. Booby was selected in the second round of the 2012 National Football League( NFL) draft by the Seahawks. He has been the teams’ starter since his first game, however, he has often been substituted to play in the stead of a defensive player in a few games. Having stayed long in the game, he has gathered a few experiences and has often spoken on how consistent practice and plays make his game easier. The footballer always reads games before going into them, often times, he prefers watching tapes of previous games, studying every move and noting different runs and passes made by teams. With the knowledge he gathers, he puts them into practice and rarely disappoints whenever he is on the gridiron. On the day of his birth, June 27, 1990, in Los Angeles California, we could vouch that the nurses and doctors in charge that day felt they delivered a random baby, they never knew that that child would emerge to be one of the best NFL Linebackers in history. His parents are Phenia Wagner (mother) and Bobby Wagner Snr. (father). He has two siblings named- Robert Wagner and Nakima Ward. Unfortunately, the family lost the mother of their home to a heart attack in 2009. While his mom was alive, she stood behind her son and gave him all the care he would ever ask for. Surprisingly, Bobby Wagner while at Colony High School in Ontario was not noted as one of the excellent footballers the school had, he was even rated as a two-star recruit and had a few offers from colleges. However, when he got committed to Utah State University football team, he improved tremendously and excelled there, drawing the attention of the Seahawks scout team during the 2012 National Football draft. Having passed the whole criteria for selection set by the Seahawks, Booby was selected in the 2nd round of the 2012 NFL Draft. His early games with the team were quite tough as he was trying to understand the tactics behind every move. With time, he topped over his peers and won eight straight games during the team’s preseason opener and two in the team’s postseason games. Bobby Wagner recorded his first career start with the team in a game against the Arizona Cardinals. In that game, he recorded four combined tackle. He improved in his next game and topped a tackle to his previous record in a tussle against the New England Patriots. He recorded his first pass deflections and interceptions in his next game which was against the Arizona Cardinals. By the end of his rookie season, he totaled 87 solo, 4 pass deflections, three interceptions. and two sacks. Just in his rookie season, he was named as the second-best inside linebacker by Pro Football Focus. The following season, Bobby Wagner was substituted to fill the position of the middle linebacker. The NFL star recorded nine combined tackles, deflected a pass, and an interception in his game against the Jacksonville Jaguars. Bobby incurred the first injury since he went pro and missed out in two games. He returned in high spirits and pulled the Tampa Bay Buccaneers to a loss. His game against the St Louis Rams was more of a duplicate of his many wins as he recorded a season-high 12 combined tackles. By the end of the season, he totaled 72 solo, 7 pass deflections, 5 tackles and 2 interceptions including 14 starts. His performance that season earned him the spot of being the 61st best player in the league in 2013. The footballer led his team to win the Super Bowl XLVIII. 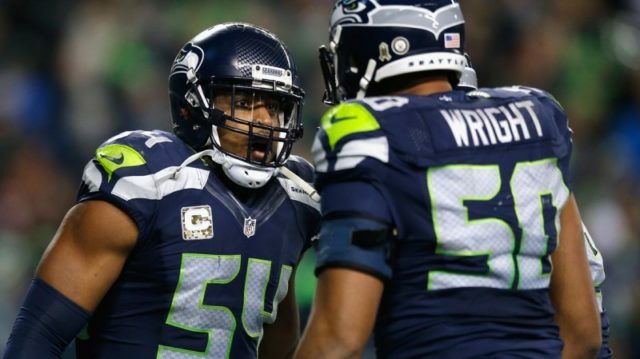 In 2014, Bobby Wagner appeared in the season opener but was later hindered by an injury which kept him off 5 games. He returned and continued leading his team to so many victories and he was named as the 69th NFL Top 100 players that year. The following year, Bobby continued doing what he knew how to do best and led his team to win a Probowl competition. He moved ahead on the list of NFL Top Players and emerged as the 39th position in 2017. It is unarguable that the Hawks has no regret in their decision on recruiting Bobby Wanger, records have it that since the footballer joined the team, they have made a lot more victories than history has ever recorded. In fact, Bobby Wanger is considered as the best player in the team. Family – Girlfriend, Wife, and Daughter. Bobby Wagner took solace in the birth of his daughter Quinncey Wagner after his mother passed on. The baby was born to him just before his mom took her last breath. The footballer has taken the affairs of his personal life off the spotlight. He has neither revealed the identity of the mother of his child nor his girlfriend or wife.